In Oakland County, kids get help focusing on what’s being said. You can’t escape Suzy Glover’s voice, whether you’re sitting directly in front of her or at the back of her second-grade classroom. That’s because of a small device, commonly called a sound amplifier, that projects her voice to all corners of the room at Martell Elementary School in Troy. Traditionally an aid for hearing-impaired students, amplifiers are increasingly being used in regular classes, mostly at the kindergarten to third-grade level. Kids at that age often have ear infections, which can limit hearing for up to two months, said Joan Firestone, early childhood consultant for Oakland Schools, Oakland County’s intermediate school district. They also often have trouble distinguishing between sounds and concentrating because of background noises and classroom reverberations, Firestone said. When there’s a lot of noise in a classroom, “they have a hard time filtering what’s important to listen to and what’s not. When a teacher has an amplification, they know what to focus on,” said Ferndale School District Superintendent Marcee Martin. Teachers use it mostly when talking to the class as a group. When talking individually to a child, Gloverturns the transmitter off. 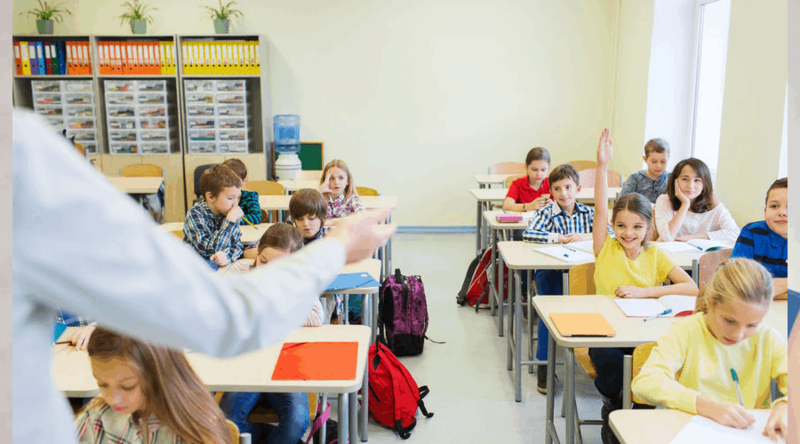 The device amplifies a teacher’s voice by about 10 decibels, which is loud enough for students no matter where they are seated, but not so loud that neighboring classrooms can hear it. The average adult human conversational voice is about 60 decibels. Glover clips the small microphone to her shirt. A cord connects it to a transmitter strapped to her belt. The wireless device reaches speakers placed around in the classroom. Gail Whitelaw, director of clinical instruction and research at Ohio State University, said there has been a big push in the past five years for the use of amplifiers in early grades. She and colleagues have done research that found many classrooms, old and new, have poor acoustics. Whitelaw said Michigan is among the national leaders in the use of amplifiers in the classroom. Of the 28 school districts in Oakland County, 27 use the devices to varying degrees. They’re used widely in kindergarten through second-grade classes in the Troy, Bloomfield Hills, Farmington, Ferndale and Holly school districts. In Troy, two elementary schools piloted their use about seven years ago. Now, every elementary school has them at the kindergarten, first- and second-grade level, said Mike Williams, assistant superintendent of elementary education. Cost for the systems vary, ranging from $500 to $1,000. Most Oakland County districts buy the amplifiers through Oakland Schools, which can get them at a better price. “If it benefits a dozen children a year so they can move toward fulfilling their future, it’s certainly worth the expense,” Williams said. Teachers said they’ve noticed students improve their focus. They not only become better at listening to the teacher, but also to their peers. Teachers frequently have their students use the microphone to read or give reports to the class, elevating even the smallest voices. An added benefit for teachers: they go home at the end of the day with healthy voices because they no longer have to project them.